What do garden fairies look like? It's time once again to take a peek inside "The Secret Diary of a Garden Fairy" to read about what's really going on with the garden fairies here at May Dreams Gardens. Of course, I'll put on a fairly clean pair of garden gloves when I handle the diary. I don't want to leave fingerprints as evidence of reading their diary, do I? Oh shush, and don't worry that we'll get caught. 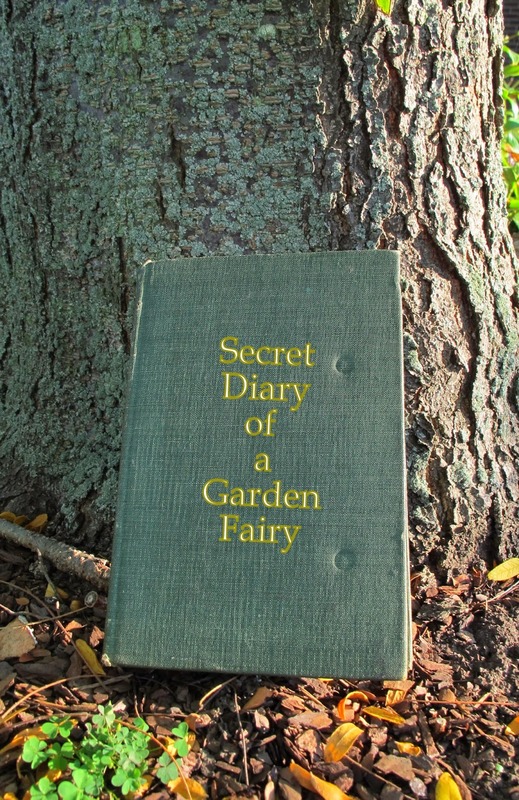 The garden fairies leave their diary out in plain sight, which I think is just a ploy to get us to read it. Plus, we'll put it right back when we are done. I just got on Carol's computer and took a look at pictures of garden fairies on Pinterest. I am appalled and take great umbrage at how they think garden fairies look. Some of those drawings of garden fairies look absolutely frightening, with pointed ears and mean looking faces. Others look all moon-eyed and comical, with eyes nearly as big as their heads. And don't get me started on the plastic statues of so-called garden fairies. Those in no way represent real garden fairies. Where in the world do people get their ideas about what garden fairies look like? I really should set them straight. If I could tell them, here's what I'd say. First, there is no way for mere gardeners to know what garden fairies look like. We live in a dimension called the garden dimension. Only a small handful of people have ever spent enough time in a garden to actual see into this dimension. And even when they do see into this garden dimension, they have no idea they are seeing garden fairies. Second, we are nearly invisible and are masters of disguise and camouflage. We can lay on a flower, and look like a bit of light shining on a petal. We can stretch across the edge of a leaf and make it appear as though the edge of the leaf has just curled up a bit. We can flicker by a gardener sometimes looking like butterflies or bees or late at night we look like moths. Sometimes we look like a tiny bird feather or a wisp of rabbit fur, floating through the air. We can hide in in the crevices of tree trunks. No one ever sees us there. Nor do people think to look in patches of clover, where we hide during the day. We don hats made of clover flowers and to most people we just look like clover flowers. Finally, I would tell all the good people who are trying to draw us to just think of the flickers of light and shadows amongst the flowers and leaves. That's usually us, in the garden dimension, visible for just a split second, hardly enough time for anyone to see us, but just enough time for someone who is a believer in garden fairies to know we are there. Dear Diary, that's what I would explain to people about what garden fairies look like, if I could. But most wouldn't understand and would continue to draw their silly drawings and paint those awful plastic figurines. But perhaps it would be worth explaining for those few gardeners who would understand?" Wow, that was quite the diary entry. Much more info than I ever expected, but it does explain quite a bit about what garden fairies look like. The next time I'm in my garden, I'm going to watch the light and shadows and see if I can see into that garden dimension where the garden fairies are. Oh don't worry. I'm putting the diary back where I found it. I promise to get it out again soon and pass along any other interesting entries. Ah yes, the little darlings visit here regularly. I am surprised tho that they allow you to read their diary. Oh, I do believe I see them every day now that I know what they look like. Stop reading their diary! I'm surprised the garden fairies keep leaving their diary out where you can find it, Carol. I think you must be very special, because they seem to have chosen you as their spokesman to educate us poor humans who think we can capture something as ethereal as a fairy.